International Award-Winning Dancers Make San Diego Debut as Artistic Directors with Southern California Ballet’s 26th Annual Nutcracker. San Diego, CA — Southern California Ballet’s 26th annual production of The Nutcracker marks the directorial debut of international award-winning dancers Martha Leebolt and Toby Batley, who took the helm of Southern California Ballet as artistic directors in September 2017. Taking place on Saturday, Dec. 16 at 1:00 p.m. and 7:00 p.m., and Sunday, Dec. 17 at 1:00 p.m., the production will feature world-class guest artists David Ward, Laura Somers Moreton, and Isaiah Bindel, a San Diego native, in the roles of Sugarplum Cavalier, Sugarplum Fairy, and Snow Cavalier, respectively. These guest appearances serve as a marvelous addition to the production by former principals, Martha and Toby, who have returned to San Diego from Northern Ballet in Leeds, England to lead Southern California Ballet to new heights and help further artistic education in the area. Throughout the production’s twenty-six years, former artistic director Sylvia Palmer has been dedicated not only to showcasing SCB’s students and youth company in The Nutcracker, but also to bringing inspiring guest artists from countries across the world to San Diego. The new artistic directors will continue this vision in this year’s production. A Maryville, TN native, Laura Somers Morton was trained under her mother's direction, Amy Morton Vaughn, at Van Metre School of Dance. As a member of Appalachian Ballet Company, she danced the role of Clara in The Nutcracker for two years. A few of Laura's most treasured performances with ABC include 'Tinkerbell' in Amy Vaughn's premiere of Peter Pan and the soloist in both Kylie Berry's Reality and Awareness. Laura was a scholarship recipient and able to study at many summer intensives including Houston Ballet, Boston Ballet, Chautauqua Institute, and Atlanta Ballet. At age 16, she trained with the Houston Ballet Academy where she completed her high school studies online. In 2014, she joined Atlanta Ballet's second company and in 2016 was promoted to an apprentice in Atlanta Ballet. This past summer, she continued her dance studies in Italy. In her professional experience with Atlanta Ballet, Laura had the honor of performing 'Carabosse' in John McFall's Sleeping Beauty. She was also featured in David Bintley’s Carmina Burana, Jiri Kylian's Petit Mort, Liam Scarlett's Vespertine, George Balanchine's Serenade and his Allegro Brilliante. Laura was a demi-soloist in Helen Pickett's Camino Real based on Tennessee Williams’ play. Laura was most recently seen as a guest artist in ABC’s Bluejeans and Ballet, and was the lead dancer in Knoxville Symphony Orchestra’s Estancia, presented at the Tennessee Theatre in Knoxville, Tennessee during their Red, Hot & Bolero performance. Former leading dancer with BalletMet where he spent the past seven years, David Ward trained at the English National Ballet School and spent five years dancing with Northern Ballet in Leeds, England. Mr. Ward’s career highlights include touring across mainland China, Hong Kong, Macao, and Thailand, as well as dancing for Prince Edward. He also danced in the International Ballet Stars Gala and was a guest performer in Las Vegas. Mr. Ward has spent past summers as a guest performer at the National Choreographer’s Initiative for their tenth anniversary performance and with Terpsicorps Theatre of Dance in North Carolina. Mr. Ward’s favorite performances include the title roles of Hamlet, Peter Pan, and Dracula. The most memorable performances include dancing the role of Romeo in Romeo and Juliet, the Cavalier in The Nutcracker, and the Prince in Cinderella, The Sleeping Beauty, and Swan Lake. A San Diego born dancer, Isaiah Bindel danced with San Francisco Ballet and DawsonDanceSF, and has previously performed with Southern California Ballet in 2014 and 2015. SCB welcomes him back this year to perform the role of Snow Cavalier. He will be partnering Southern California Ballet-trained Calista Cartwright. In addition to bringing in international talent, Southern California Ballet is proud to train dancers with the skill and talent to be able to perform principal roles in its professional-level performances. Calista Cartwright, who will dance the role of Snow Queen, is a Westview High School senior who began dancing at the Rozann-Zimmerman Ballet Center in Los Angeles at age 3, began training with Southern California Ballet at age 13, and has been part of its company program for two years. Bernardo Heights and Marshall Middle School students Melia Koverchuk, Misha MacGowan, and Lucie Fiorino will dance the story’s young heroine, Clara, while Zach Ong will dance the role of Clara’s rambunctious younger brother, Fritz. Soloist roles such as Spanish Chocolate, Turkish Delight, and Chinese Tea, as well as the stunning snow scene and flower waltz, feature youth company dancers: Calista Cartwright, Westview High School; Josie Cole, Poway High School; Samuel Fiorino, Rancho Bernardo High School; Madeline Franz, Bernardo Heights Middle School; Lily Hofstetter, Mesa Verde Middle School; Sanae Kanenobu, Poway High School; Kayla Kressin, Poway High school; Amecie Lublin, Del Lago Academy; Erika McCann, Westview High School; Kelsy Paraoan, Del Norte High School; Kanaha Takeda, Rancho Bernardo High School; Kalei Tano, The Classical Academy; Kendal Weatherhead, Maranatha Christian School; and Leah Zabezhinsky, Rancho Bernardo High School. Save the date! Public performances of The Nutcracker will take place Saturday, Dec. 16 at 1:00 p.m. and 7:00 p.m., and Sunday, Dec. 17 at 1:00 p.m. at the Poway Center for the Performing Arts. Tickets will be sold both through the SCB website, www.southerncaliforniaballet.org/nutcracker, and at the PCPA Box Office. Tickets are priced at $20, $29, or $38. Student, senior, group, and military discounts are available. 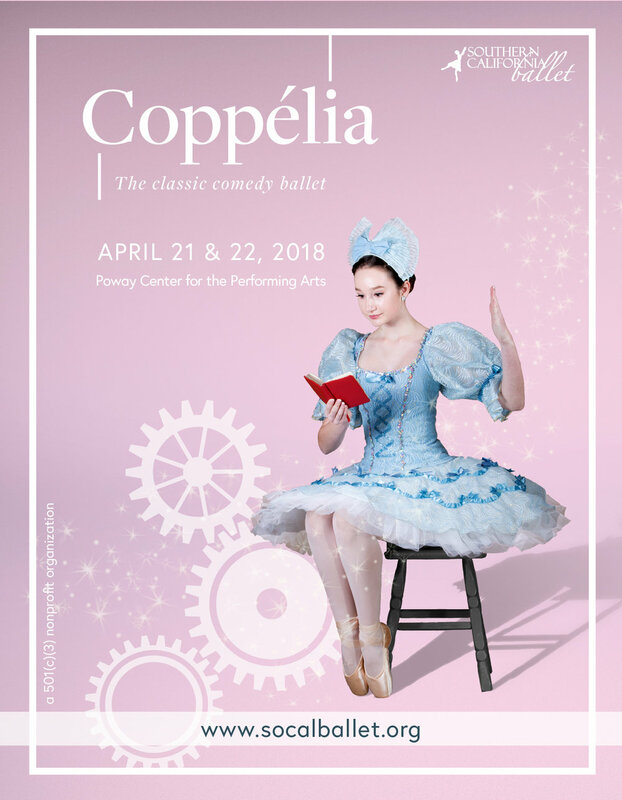 Southern California Ballet is proud of its commitment to furthering artistic education in the area and for that reason dedicates four performances at $5 a ticket to outreach for schoolchildren, special needs groups, and seniors on hursday, December 14th and Friday, December 15th at :15 a.m. and 11:15 a.m both days. SCB also supports P.L.A.Y., Poway Leisure Assistance for Youth, Girls Scouts of America, and senior assisted living centers through reduced ticket prices striving to make ballet accessible and affordable for all to enjoy. San Diego, CA — On July 29, three Southern California Ballet dancers will board an airplane to Florence, Italy wearing their Cecchetti Team USA jackets to compete in the fifth Cecchetti International Ballet Competition. Dancers Amy McMaster, Kalena Tano and Kelsy Paroaon were selected by a national jury to represent Cecchetti USA and compete against dancers from Cecchetti Ballet Australia, Cecchetti Society of Canada, Cecchetti Council of America, Cecchetti Society of Southern Africa, Cecchetti Society Classical Ballet Faculty ISTD and Danzare Cecchetti- Ancec Italia. The competition takes place every three years and is comprised of a junior and senior division. Cecchetti Team USA will send seven senior and five junior dancers who have passed intermediate and advanced Cecchetti exams. Amy McMaster, a 2016 graduate of Westview High, currently attending the School of Dance at the University of Utah, will compete in the senior division as well as Kalena Tano, a 2017 graduate of Rancho Bernardo High School and future UCSD freshman in Dance and Literature. Kelsy Paroaon, a 2017 graduate of Oak Valley Middle School is one of five dancers in the junior division. The competition takes place in the Obihall Theatre, Florence on the bank of the Arno river and dancers will be judged during a ballet class on their acquisition and execution of the Cecchetti technique. On Thursday and Friday, August 3 & 4, classical and contemporary solos will be presented and finalists announced on Friday evening. The event ends on Saturday, August 5 with a Grand Gala evening featuring illustrious international guests and the announcement of awards and scholarships. The jury consists of teachers, directors and choreographers holding the highest rankings in the world of ballet including Bella Ratchinskaya, Ballet Mistress, Wiener Staatsoper Ballet Akademie; Fabienne Cerutti, Faculty, Paris Opera; Jan Broeckx , Director, Ballet Academy of the University of Music and Performing Arts Munich; Larissa Saveliev, Artistic Director and Founder Youth America Grand Prix; Nicola Katrak, Teacher, The Royal Ballet School; Michele Merola, Founder and Artistic Director, MM Contemporary Dance Company; Oliver Matz, Director, Dance Academy Zurich; Raymond Lukens, Artistic Associate, American Ballet Theater; Samira Saidi, Director of Dance, English National Ballet School; Steffi Scherzer, Director, Dance Academy Zurich.